OK, I know this is not particularly cool to post twice in one day, but tough. 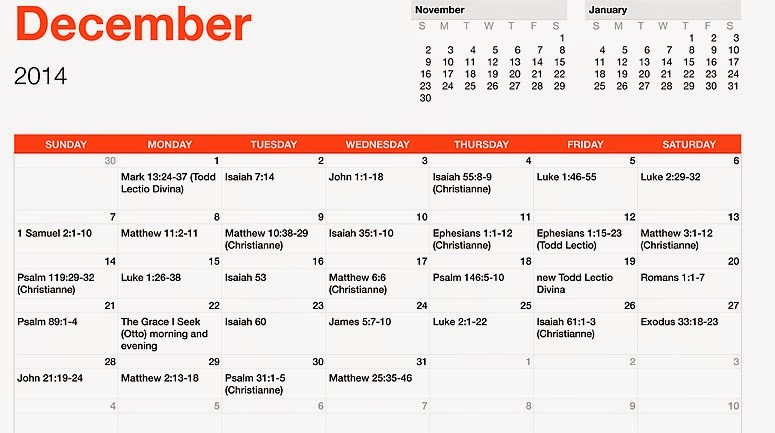 I managed to Pin God First (led by Jennifer Dukes Lee) every day this month (of November) except one day when I had an early business meeting. How did it go? Well, even though I light candles at my home altar and pray ... my mind managed to whirl and drift and for the most part it was pretty frustrating. I thought my brain would be more quiet, somehow, that I'd hear God more or at least sense the Divine. I was thinking that maybe what I need to do is a month of Anglican rosarying (I'm sure that isn't a word) first thing in the morning to empty out my brain but instead, today, I put together a schedule for myself to continue the lectio divina practice through December. I thought it'd be neat to share it here in case, you know, you wanted to too. Christianne is over at Still Forming, and I really enjoy her guided lectio divina meditations and yet I am somehow behind. The recordings came from being signed up on her mailing list. I can't find them on her website and she isn't currently including them in her emails. Finally, Any Otto at God in All Things shared a couple of examen audio exercises on his blog and I still haven't listened to them, so while they're not actually lectio divina, I scheduled one of those. If you'd like to learn more about how to lectio divina, this article by Fr. Luke Dysinger covers it very well, including in group settings.